The croissants at Smith & Deli are definitely the best vegan croissants that I have ever had and some of the nicest croissants full stop. They’ve got the flaky layering right, which is hard to do. I’ve enjoyed them plain with some apricot jam made by my neighbour. 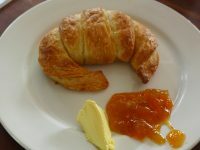 I approached the Croissantwich of Eastwick with some trepidation. Let me state up front that I am no fan of the savoury croissant. I hold an irrational (or possibly rational) hatred of them. I am a firm traditionalist. They belong with jam. I never liked ham, cheese and tomato croissants before I was vegan, so there is no real reason I should enjoy a vegan version. But for science I ate one. 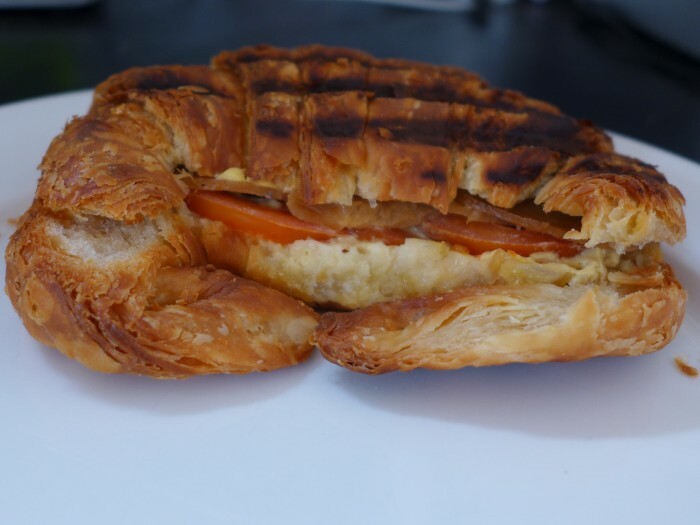 It is a grilled croissant with mustard, house made mozzarella, tomato and seitan based ham. Tasty enough, but just wrong. Not my favourite, but that’s me. I think savoury croissants are an abomination. 🙂 If you like them then you will enjoy it. The croissant makes it great. Rant over. Hand me some jam. Me? 6/10. An unbiased score for those that like savoury croissants 9/10. That’s funny, I’m the total opposite. Croissants are always best savoury in my book. But then, I don’t have a sweet tooth. I really liked this one and feel the toasting makes it more croissanty than the untoasted ones from Smith & Deli. I prefer savoury croissants! Hee hee, I can’t wait to get this in my face next week! I love savoury croissants!